It was a good day yesterday and I do not believe that Will Richardson and I could have complimented each other’s messages any better if we’d planned it. The theme seemed to be “hyperconnected youngsters” — and what that means in the broader sense of education. Will does an amazing job of presenting a scenario, and then provoking educators to think about it from the perspective of students, their learning, and their future. I did two breakout sessions called “Educating the Information Artisan.” I’d kicked around several ideas for this, but ended out generating some discussion around examples of infographics and data visualization — and potentials of getting students into that business. The discussion was great, but I was less than entirely satisfied with my work — partly because my voice was in shreds after the keynote (and a mild cold I’m getting over). Now, ‘m wondering if I should have spent the time exploring applications similar to what Neil Stephenson is doing at the Calgary Science School. I had several conversations with Neil during and around some staff development I did in Calgary last week (or week before last?). His project started with a virtual visit to the Canadian Museum of Civilization in Ottawa, where he ran across an online display of old cigar boxes, called Canada in a Box. The exhibit, currated by Sheldon Posen, tells the story of Canada as expressed through the pictures printed on the covers of old cigar boxes. A social studies teacher, Neil decided to make The Cigar Box Project an ongoing activity for his grade 7 students, asking them to produce cigar box printings that tell something of the history of Canada. Neil has written extensively about the project and it has been extensively written about — also earning the young teacher several prestigious accolades (he was too modest to clarify). Panels of student work in telling the history of Canada through Cigar Boxes. 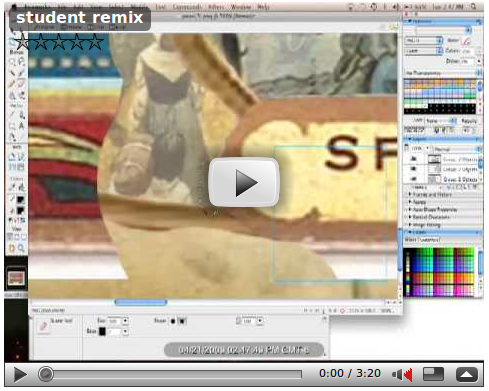 Being a 1:1 school, using mostly Apple Macs, they used Macromedia Fireworks to do their work, and extensive historic research as well as searches for public domain and creative commons licensed images to include. To the right are some example panels produced by these 7th graders — and as you can see, it is quite impressive work.I can barely imagine the amount of work that went into these panels. But I suppose that their investments of time and talent would fall into two categories. One is the intellectual effort and growing skills involved in locating and organizing their knowledge and media elements — and the decisions and associated criteria to tell their story. The second category would be the craftsmanship that the students developed and demonstrated in their work. This video, which I may start using in one of my presentations, illustrates the work and skill that went into the construction of the panels. The project seems to include all of the elements that I have been talking about lately in “Cracking the ‘Native’ Information Experience.” But there is one weakness to the project, as I see it. These 12 and 13 year-olds invested an enormous amount of research and craftsmanship (not to mention the hours) into producing these quite impressive displays. This work begs to be shared, and not just on a teacher’s blog. I suggested this to Neil and he told me that he had made arrangements with the Ottawa museum and that an education consortium in Alberta was working on preparing the students’ work to be included in the online display. But the consortium project ran out of money and the preparations were not completed. But even this is not enough, in my opinion, to fully appreciate the work of these information artisans. It needs to be of practical value to be more than just classwork — no matter how engaged and personally invested the students were. I just did some quick research and there are companies that will make custom-sized and printed boxes. What if some local company in Calgary donated the money to have 5,000 (arbitrary number) boxes produced, with the students panels printed on them, and sized to hold crayons for elementary students in the school. Each year, a new batch could be ordered and produced, based on that class’ work, and the next year, boxes are handed out to youngsters for their crayons, with the story that these boxes were created by 7th graders who used them to tell about Canada’s past. I surely needed to be doing something else today, but one of my deepest interests, data visualization, is such a seductive distraction for me — and ever since I saw Hans Rosling’s dazzling TEDTalk on “the best stats you’ve ever seen,” I have been intrigued by graphs that move. It seems, now, that Google has added the same sort of motion graph widget to Google Docs Spreadsheets, and I started playing around with things that I could demo in an upcoming presentation. I didn’t find anything that was perfect for the presentation, but pulling the “Internet Usage Statistics” up out of my Delicious account gave me an idea. Unlike most spreadsheet layouts for graphing, the dates are stacked as shown here. 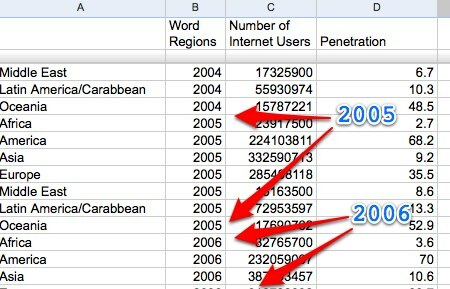 I went to The Way Back Machine and found archived versions of the stats page going back to 2002 — and the 2000 data is available in all of the graphs, as a comparison. Then I began to re-type the data into a Google Docs Spreadsheet. I could have come up with a funky way to import it in, but there was so little data, that I just re-typed. I found a number of irregularities in the data that I could only reconcile mathematically and not historically — but I was doing this for the fun of it anyway. The layout of the data in the spreadsheet is critical. Counter intuitive is the fact that you have to group the item (region of the world) and the time (2000-2009) on a single row. This way 2000 repeats itself for each region and then 2002 – 2009. To the right on each row is the number of Internet users per region per year and its penetration (percent of the the total population of the region at that time). I have the chart configured to start with the population along the horizontal axis and the totol number of uses along the vertical. But you can change these easily as well as set individual regions to trace their changes. 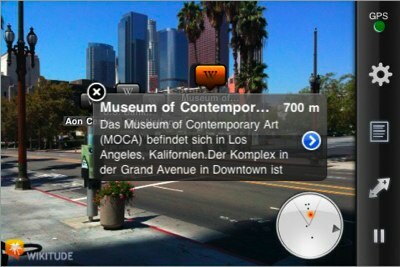 I have not seen any compelling reason to upgrade my iPhone to a 3G system — until a few days ago when I read about Wikitude, a new iPhone app that turns your phone into an augmented reality device. Point your phone and Wikipedia articles about the object(s) you are looking at float before your eyes (or in your palm). I’m still struggling with catching up on my e-mail. The problem is those messages that I get stuck on, someone who’d like a new source added to Citation Machine, or “Blabberize embeds aren’t working with Class Blogmeister!” — and I get bogged down in coding. Then there’s the question that is so interesting that I start thinking and writing and thinking and writing, and it becomes an even greater time sink. At least when the programming works, you’re done with it. ..I am afraid that being overly concerned about personal pocket technologies is preventing us from addressing the far larger issue of helping our students learn and work within today’s information landscape. The prevailingly digital and networked content that surrounds us is different, in almost every way, from the textbooks we continue to pour educational dollars into. Rather than working to block pocket technologies from entering the classroom, we need to be working harder to get more full-featured information and communication technologies (laptops or netbooks) under the arms of every teacher and student learner and establishing platforms for learning in this new landscape. Those of you who know me, can probably see me cringe, when I glance at a magazine article headed with “If you can’t Use Technology Get Out of Teaching!” And then I see that I’m quoted all over the article. 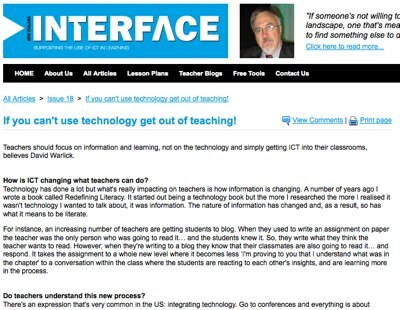 It is published in NZ Interface, a New Zealand education technology publication that I have followed since first working in that magnificent country several years ago. Of course there’s not a thing wrong with the title. After all, I’ve frequently claimed that a teacher who is not using contemporary information and communication technologies is not doing his job, even though he may be a good teacher. But I would focus on the information and communications part, and ignore, as much as possible, the “T” word. I’m pretty pleased with the article itself. I remember being interviewed by Greg Adams, the editor of the magazine, a few months ago when I was speaking at an administrators’ conference in North Palmerston, NZ. The article seems to be pretty much a word-for-word of my responses — being aware that it was the end of a very long day of presenting after a very long day of flying across about eleven time zones. But the my finding of this article, I think, further demonstrates my point. Yesterday morning, with about five minutes before my pickup, here in Lethbridge Alberta, I popped over to Tweetdeck to post a short statement of my location and mood, only to find a hyperlink to the article in my “mentions” column (column in Tweetdeck of tweets with my name in them). It was a tweet from Christina Löfving, a retweet (RT) from Stephan Pålsson. You’ll notice that she’s from one of those countries that over uses dots in their language. Checking her Twitter profile, I discovered that Christina is an ed tech’er from Sweden, Stenungsund to be precise, and she has a blog called IT-Mamman (IT-Mother). Stephan has run a company, HyperFinder, since 2001, focusing on news coverage, journalism and social analysis. He says in his Protopage profile — in Swedish. Framför allt arbetar jag med hur IT- och samhällsutvecklingen skapar nya möjligheter för undervisning och lärande, i och utanför det formella utbildningssystemet. Above all, I am working on how IT and social change creates new opportunities for teaching and learning, in and outside the formal education system. My point is that during this five minutes of investigating this newly found (directed to) article including my ideas, published in New Zealand, I never once thought “Technology.” I was not working with technology. I wasn’t thinking about technology. I was working with information, tracking its flow through its avenues of communication. I was concerned about the behavior of information. I probably wouldn’t say, “If you can’t use technology get out of teaching!” But I’d gladly say, “If you’re not teaching within a contemporary information landscape (networked, digital, abundant information), you’d probably have a pretty hard time finding another profession that doesn’t. But the last thing you should be doing is preparing children for their future. 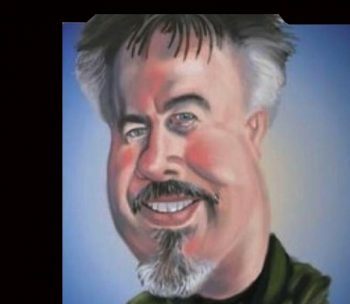 Author David WarlickPosted on October 21, 2009 October 22, 2009 Categories education1 Comment on Did I Say That? What Difference Might One “S” Make? Last week was one of those trips where I was either presenting, driving, flying, or sleeping. There was one wonderful time of relaxed comradery, when I went out to eat with Steve Dembo (IL), and Scott McLeod and other notables from the Iowa ed tech community. It was a laid-back gathering and I, oddly enough, ordered seafood and linguine. Although it was quite good, one shouldn’t order seafood that far away from the ocean. I should have had pork. Interestingly, I had to browse through several pages of Flickr Creative Commons photos with “computer” and “class” in the description before I found one with computers. Lot of robotics. What I want to think about, in this writing (at 36,000 feet over Montana), is a conference session that I attended a while back that was actually more of a meeting of educators interested in technology education. 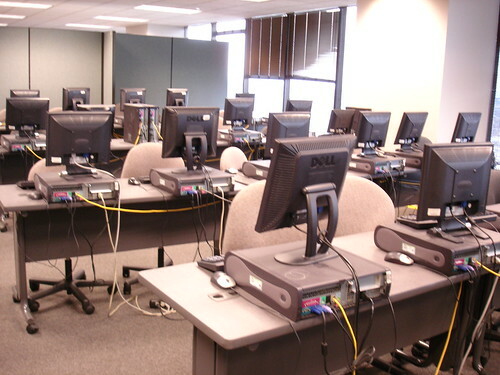 It is not an uncommon situation, where, in an effort to decrease the number of mandated tests, the state’s computer skills assessment has been abolished. No one was excessively upset about losing the test. But they are beginning to see decreased enrollment in the state’s computer applications course, the offering of which brings much needed state funds into the districts. I mostly stayed quiet during the conversation, not knowing the nuances of the situation, and the one or two comments that I did make probably seemed pretty far outside the box — which is where I live most of the time. But I’ve continued to think about the meeting, their challenge, and the truly impressive conversation that I witnessed. I wanted to ask the group about what was being taught in the CompApp course, but didn’t want to waste time with any discussion that was for my benefit alone. If it is like most CompApp classes, though, then they teach basic productivity software like word processing, spreadsheets, presentation software, and databases. This model goes back to the old Appleworks, MicrosoftWorks, and Microsoft Office suites of the same applications. I know that many of these required computer classes have come to include web building, desktop publishing, blogging and video editing as well as other more recent applications. I have a number of conflicting thoughts about the situation, which I would like to explore here. First of all, many students do not need such a class. They have grown up with computers as a principle tool for carrying on their daily activities. They have basic word processing and presentation skills. They’ve probably not had much experience with spreadsheets and who needs to know how to use Access (Database) anymore. They likely do not know the intricacies of these applications, which would be a part of this CompApp course, but I suspect that they know enough that they could teach themselves what they’d need to know to accomplish immediate goals. On the other hand, there are also many students who have not had the benefit of convenient access and have not attained the experience necessary to continue to grow their own information and communication technology (ICT) skills. These students desperately need the opportunity to develop skills in using ICT and to gain the experience needed to be self-directed learners. Several people in the session suggested that without a course, students could develop these skills within the context of other subjects. This has the enormous advantage of being a much more authentic way of learning. Still, it has the disadvantage of relying on teachers, who sometimes lack the confident to adapt their lessons to include ICT. I have to confess that the one thing that truly bothered me about the conversation became apparent to me when someone stated that their job was to help their students gain the technology skills they will need after they graduate. It occurred to me was that, “You can’t!” We do not know what skills they will need. We do not know what word processing will look like in ten years — in five years — or if it will still exist. We do not even know if there will be something new, a new killer app, something that we have no hope of “training” them for today. So I’ve been thinking that instead of Computer Applications, our students should be learning Computer Application. One letter’s difference, a dropped “S,” but a world of difference when it comes to curriculum. Computer Applications implies (to me) a specific list of software tools that students will be taught to use — one tool for a few weeks, then another tool, and then another. Instead, I would suggest that students simply learn to apply computers to solve problems or accomplish goals. It really doesn’t matter if they are covering all of the tools, or even if each student is mastering all of the same tools. Students would simply learn how computers can help them do interesting things, and then gain the skills and confidence required to teach themselves, with the guidance of their teachers, the applications to make it happen. I’d see this as being more of an independent study type course, where students have access to a wide variety of tools, projects accomplished and archived by former students, and libraries of videos of various interesting applications of computers. They would design a project that applies to something that they are learning in another class. I think that it would be even more authentic for students to rely on each other for help with the technology, or even connect to older students who have already taken it, through various social networking opportunities. Do you really need a course at all. Why not require (at some level) that every student accomplish a significant project for graduation from each school level (or each grade). The only requirements would be that it applies to something they are learning or have learned in school, you have to be able to hand it in on a thumb drive or via a URL, and it would be assessed by instructional staff, other students, school/district governance, and members of the community. We must have just crossed the boarder into Canada. My feet are getting really cold. Author David WarlickPosted on October 19, 2009 October 19, 2009 Categories conferences, educationTags computer applications, education, technology, warlick31 Comments on What Difference Might One “S” Make? I am such a weak man. I went down stairs last night to buy a Diet Coke and look what I came back up to my room with. 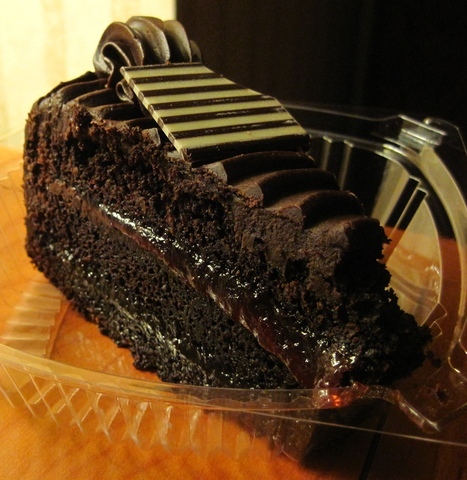 Dark chocolate cake with raspberry filling. I am such a weak man! It’s been a great week, though quite exhausting. At least I had a few undisturbed hours in my hotel room yesterday afternoon and evening — mostly preparing for today’s luncheon keynote for the Texas TECSIG meeting — a brand new keynote. Yesterday I spoke to the Target Tech group at the Airport (Austin) Hilton. These were representatives from schools, districts, and collaboratives who have earned ARRA funding to implement their innovative proposals. It was something of an odd venue. I have presented indoors, outdoors, in basketball gyms, and even a couple of tents (“Be Healed!!”). But yesterday was the first time I’ve ever presented in a former Air Force command bunker. Very odd! But I feel that this is not enough — especially if we want the more experienced and forward reaching educators to continue to attend these conferences. 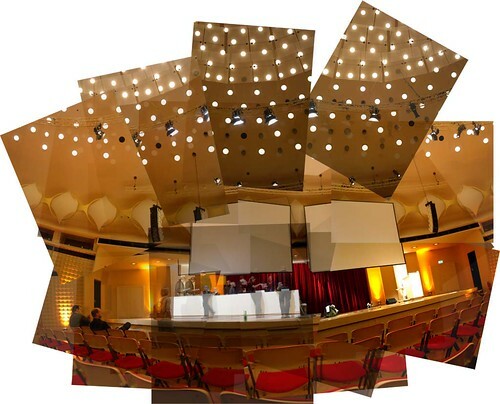 I was wondering about a dedicated room at the conferences that might be called the “Choir Loft.” This is where conference attendees would go, who find no sessions, at a particular time slot, that appeal to them (that teach them something new). It would act like a blogger cafe, but set up explicitly for conversation. It could still be set up like a lounge, with chairs and tables for small group conversations, but also facility for larger group un-conference still learning. The Tweet-Up, at ITEC, was very much like this, though we had to find a table, though we had to continue to slide back as more people joined us. It was a conversation about what people wanted to explore. For some of the Tweople there, it may have been the highpoint of the event (my keynote aside). Well, I need to find a picture of a bird dog for my opening visual this morning. I often write about the need for a new type of textbook, one that is digital, interactive, social, open, and a product that actually results from student learning as much as student learning results from the product. I frequently get comments of agreement, stating the need for digital text books with video and audio and interactive objects — and I agree whole-heartedly with these observations. I think that this is exactly the direction we need to be going in, and these are things that need to be said again and again. But I think that our ultimate goal need to go way beyond just interactive glow and motion. 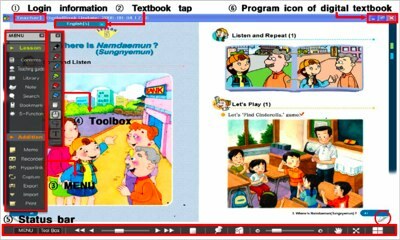 This is fast food for learning! Now don’t get me wrong. There is nothing wrong with fast food in moderation. It solves problems. Often I am thankful for a MacDonalds sandwich, with two hours to go on the interstate — hold the fries please. And it’s too often that I get to my hotel room at 8:30, been speaking and then traveling all day, not had anything but a mini bag of prezel’ets on the plane since breakfast — and I’m thankful that Papa Johns is just a phone call away — an extra thing of garlic sauce, please. But my preference is fresh food prepared in a real kitchen. I grew up in a small town in western North Carolina. Even though it was a small town (three stoplights), I was a townie. You could tell townies from country kids, because they wore flannel shirts and bluejeans and you never saw them at “The Pool.” We wore cloths from Belks downtown (or for us it was Sears in Shelby). My wife grew up in Charlotte (the Big City), but both her parent grew up on farms and they had a garden. Brenda tried for years to get me interested in growing a garden but to no avail — until the hot spring afternoon when she marked off the space that I would no long have to mow, if we had a garden there. I became a lover of gardening that day. 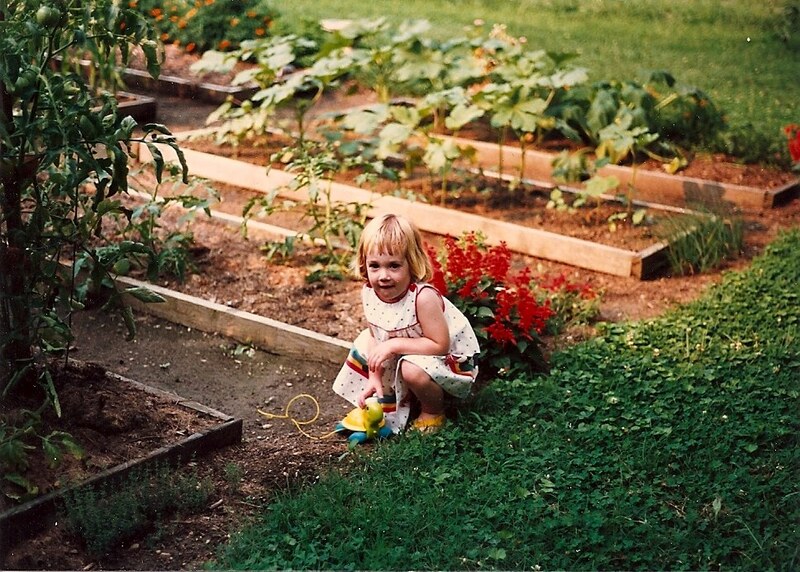 My daughter in the garden NOT fertilizing it. In the following months I learned the joys of planning, digging, building, and planting a garden. We decide up front to go organic (we were wearing flannel and jeans then, calling it “grunge”), and I discovered the thrilling challenges of cultivating what was essential a small ecosystem, where plants could be arranged to protect each other, rotated to leave nitrogen, not just absorb it, added to draw insect eating birds and bugs, and I learned to enjoy the brand new flavors of fresh produce — much of which never made it to the kitchen. When I grew up, my mom got here produce from the hyper-organized, standards-driven grocery stores, where the food was arranged in straight rows, and packaged for easy storage and consumption. We ate exclusively canned and frozen vegetables — and I never learned the true taste of asparagus, until I had it right out of the garden, steamed just a bit with a pat of real butter melted over it. This is the kind of learning that I am engaged in right now, a learning style that requires me to understand and treat my information environment like an ecosystem, where I cultivate the information, directing it to interact with other information in ways that bring me the ideas that I need to keep doing my job. Sometimes I have to look it up. And not being an especially strong reader, video and audio come in hand — and I love the art of a well executed data visulation. The fast food solves problems. But learning in a time of rapid change requires us to become information gardeners. Reading is more than it use to be. Thanks to Tom Hoffman for getting the word out about The Common Core State Standards Initiative from the National Governors Association Center for Best Practices and the Council of Chief State School Officers. 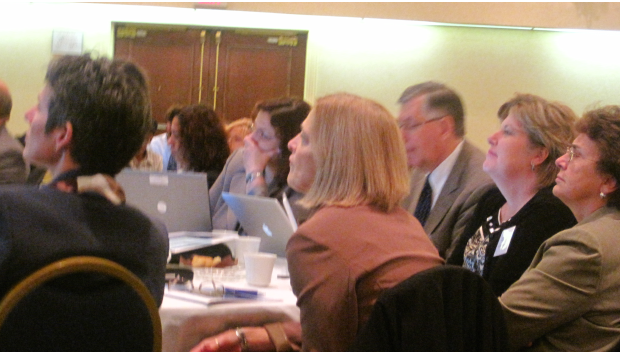 They are attempting to establish a common core of state standards in English-language arts and mathematics for grades K-12. These standards will be research and evidence-based, internationally benchmarked, aligned with college and work expectations and include rigorous content and skills. OK! That one sentence takes care of just about every buzz-key known to humankind, intended to evoke action — with the possible and seemingly unimportant exception of helping people in my country to just plain be happy and self-fulfiled. I guess if we win the globalization contest, then we’ll be happy. Ascertain the origin, credibility, and accuracy of print and online sources. Evaluate the reasoning and rhetoric that support an argument or explanation, including assessing whether the evidence provided is relevant and sufficient. As more and more of the information that we use on a daily basis is not necessarily handed to us by trusted providers, it seems to me that the skills involved in finding the evidence of the information’s reliability, validity, and appropriateness should be integrated up and down the line, 1 through 18. I would also urge developers to include, as a reading skill, the ability to locate information to be read. If my children can not skilled in use something like Google to find information that is appropriate to what they are trying to achieve, then I might prefer that they not be able to read it. I know that this all comes under what is commonly referred to as media skills. But I think that this is core — as core as reading. And it needs to be a part of any set of standards that include the ability to read. I see that a few people are blog-posting their sesson proposals for ISTE 2010. So here is the opening description for the session I am proposing. I’ll also be delivering this presentation as a luncheon keynote next week for the TEC SIG Fall Meeting in Austin — got to hurry up and finish it. To our students, it is merely the road ways of their daily and minute-by-minute travels and the tentacles of their nearly constant hyper-connectively. It is the hands and feet that take them where they want to go. Believing that our youngsters carry their mobile phones around with them because it is their technology of choice is a poor reason to desperately carve out ways of using mobile tech in our lessons. They carry their phones because that is where their friends are — and their is nothing new about youngsters wanting to be where their friends are. The code itself comes from work that I did with a group of teachers in Irving, Texas, a school district that has operated, since 1997, based on students having ubiquitous access (1:1) to networked, digital, and abundant information. In an online collaborative activity we identified and then factored down the elements of their students information activities that seemed to result in active learning, as opposed to the passive learning their predecessors had endured. Is Education Really about Data? I’m on another of those wonderful stretches at home catching up with family, trying to catch some movies and mostly spending every spare minute trying to get as much office work done as I can (some writing and work on Citation Machine) with no time to read and blog. But this post by David Wiley at Iterating Toward Openness was one of those sneaky reads that tricked me into wonder if I’m actually wrong about something. 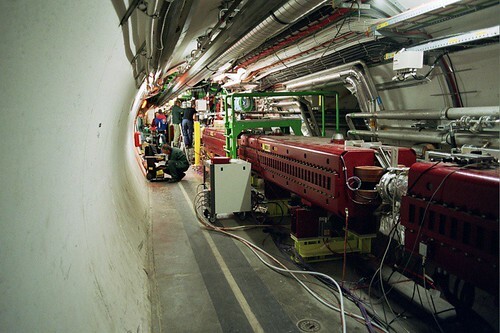 In The LHC and Education, Wiley started with his interest in the Large Hadron Collider. To say that the LHC was incredibly expensive is a sad understatement, and the machine does little more than generate data. But with that data, scientists will map realms of the universe that most of us can’t even imagine, much less see. It’s one of the reasons that “data driven decision making” doesn’t make my heart flutter the way that it does for others. It’s that, even in the best of situations, the data is scarce, shallow, grainy, and awfully expensive to collect — not to mention that the only people who can make much use of it are the data dudes that school sytems have been hiring over the past few years. I believe there is (another eay). I believe it so strongly that for the first time in several years I am opening a new line of research. I believe (and I fully admit that it is only a belief at this point) that using technology to capture, manage, and visualize educational data in support of teacher decision making has the potential to vastly improve the effectiveness of education. I believe that I have written recently (Where Obama is Getting Education “Wrong”) that I think we should be teaching students to capture, manage, and visualize data as a basic working skill. It seems to me that ushering it away to the central office to worry over data as an educational concern may actually be detrimental to the learning our students need to be engaged in. Limited resources will cause us put undue emphasis on what can be easily measured at the expense of those important skills and knowledge that can’t. But Whiley compellingly inspired in me a willingness to reconsider and I found my problem. It isn’t that I object to using data to inform better instructional decisions. It’s that the data is so lousy — ..scarce, shallow, graining, and awfully expensive to collect. What if all of our students were doing all of their content and content processing digitally. What if all of the information transactions of learning, besides the most appropriately open conversations, was done with abundant, networked, and digital content. That would be an enormously dense, rich, and seductively meaningful mass of data that could be analyzed and visualized in a wild variety of ways. I’d be happy with that — especially if students became partners with us as self-analyzers and self-assessors, mastering their own skills as information artisans. Author David WarlickPosted on October 5, 2009 October 5, 2009 Categories education, literacyTags data, education, technology, visualization, warlick15 Comments on Is Education Really about Data?